1a. 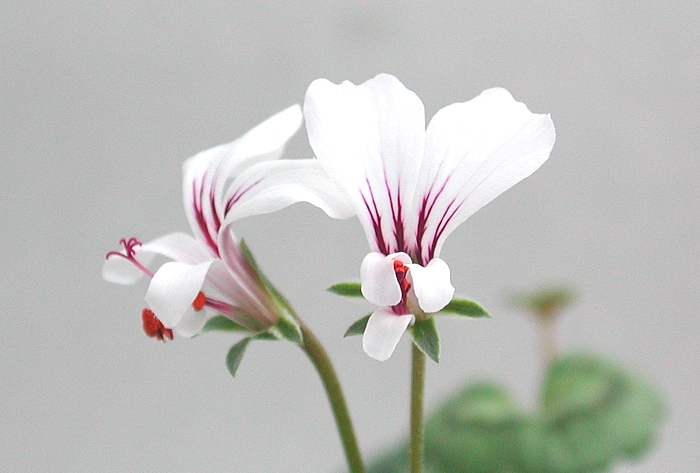 Leaves zoned, petals white with streaks, stems decumbent. 1b. Leaves not zoned, petals light purple to purple with streaks, stems erect. 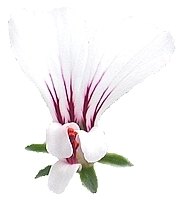 Many stemmed, aromatic, erect or decumbent, shrub or sub-shrub with a partly subterranean tuber, up to 1.2 m high, 0.5-2 m in diameter. 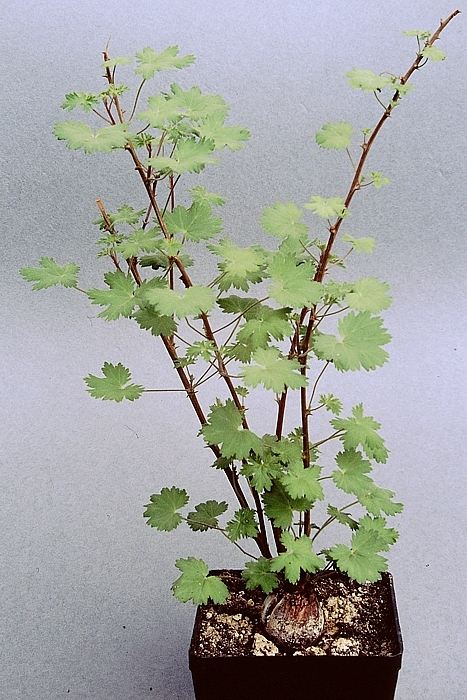 Stems vimineous, angular, sulcate or cylindrical, not distinctly jointed, herbaceous when young, becoming woody and brown with age, glabrous or sparsely hirtellous. 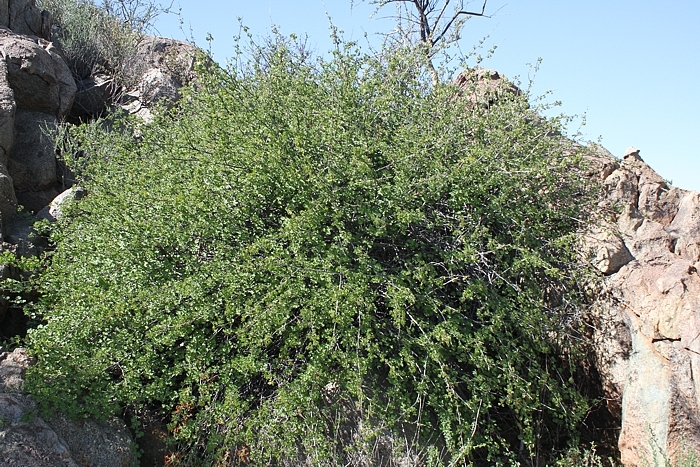 Borne in clusters of 3-4 on short branchlets, light or dark green. Lamina reniform, 5(-7) palmatilobate or palmatipartite, base cordately incised, apices rounded to truncate, margins irregularly crenate to deeply dentate, 10-17x10-20 mm. Petiole 10-25 mm, stipules subulate, membraneous or recurved persistent spines. 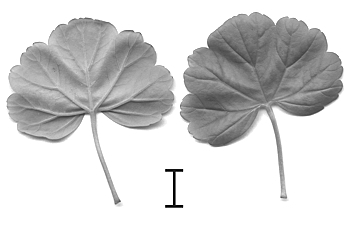 Left: Pelargonium antidysentericum ssp. 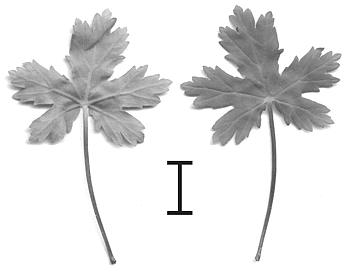 antidysentericum; right: Pelargonium antidysentericum ssp. zonale. Pseudoumbels with 2-5 flowers, peduncle 15-20 mm long, borne on short branchlets, pedicel 5-10 mm long. 5, lanceolate, 5-10x1.5-3 mm. Hypanthium 10-30 mm. 5, light purple to purple or white, with dark purple streaks, posterior two obovate-spathulate with long claws, 10-20x5-8 mm, reflexed. Anterior three spathulate with narrow claws, 10-13x2-4 mm. 7 fertile, straight or recurved, pollen orange. Circles: subsp. antidysentericum, triangle: subsp. zonale, squares: subsp. inerme. A respectable P. antidysentericum subsp. antidysentericum at Akkedis Pass, N Richtersveld, N Cape Province - this is a huge bush at least 1.5 m high! The recurved woody stipules make it well-armed against grazing animals and plant-spotters. 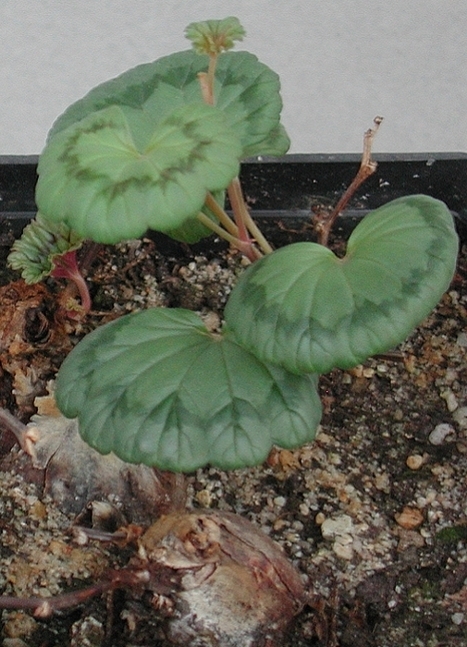 A slightly smaller plant at the same location, showing the half-exposed tuber. In contrast to ssp. antidysentericum, which left many truly painful scratches to the author, ssp. inerme is quite tame with its membraneous stipules, though otherwise looks very similar in habit. Ssp. inerme is quite common in the hills between Nieuwoudtville and Loeriesfontein. Ssp. 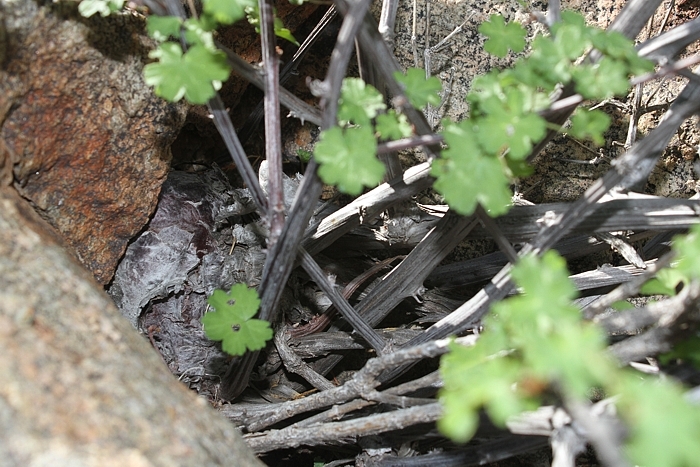 zonale looks very different to the other two subspecies in that its stems are trailing and tubers are often entirely out of sight in crevices among rocks. Here a plant just above Eksteenfontein on the S slopes of Stinkfonteinberge. This subspecies is quite common in the central Richtersveld, and tends to be replaced with ssp. 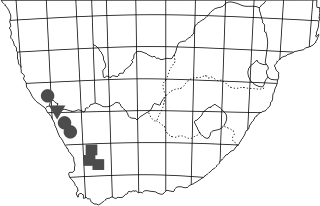 antidysentericum in the N and S Richtersveld. Scheltema A. G., van der Walt J. J. A. (1990).